Center Among The World’s Elite? A-GAME Gridiron Season IV - Kicks Off September 2018! Your team is ready to deliver...set up your league today. 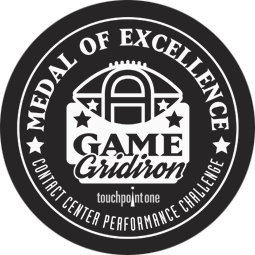 "A-GAME was not only fun to play, it really motivated my supervisors and agents to perform better, and I couldn’t be more proud of all of them for earning this Medal of Excellence Award and special recognition from TouchPoint One. The way agents stepped up to support and encourage each other was incredible and made my job so much easier and more rewarding. The A-GAME performance challenge resulted in strong improvements in attendance, utilization, and quality, and dramatically reduced our agent turnover. We look forward to competing again this Fall!" Vince Tierres, Director at Convergent Outsourcing. "Loved the team unity and competitiveness and all of the events to promote the game. Total fun." "The competitive nature and intentionality of the coaching was excellent." "A-GAME motivated us to work with other team members to improve performance and win more games." "It’s interesting how metrics can be fun, help you get better every day, and increase effort to win each game." "Gridiron helped motivate us to win and work harder at what you do already on a daily basis. We had fun...and it just gave us that extra push we need to keep scores up and come to work." "A-GAME really motivated me to be above goal each and every day." "Gridiron helps you do better on calls for game points." A-GAME transforms contact centers into exciting sports and other themed leagues in which teams participate in round-robin tournaments. At the end of the regular season, top teams advance to the playoffs and ultimately a season-end championship. A-GAME schedules align with NCAA, National Football League™ and other popular pro or collegiate league seasons. Team leaders select a starting lineup from their full agent roster. Team scores are updated in real time. 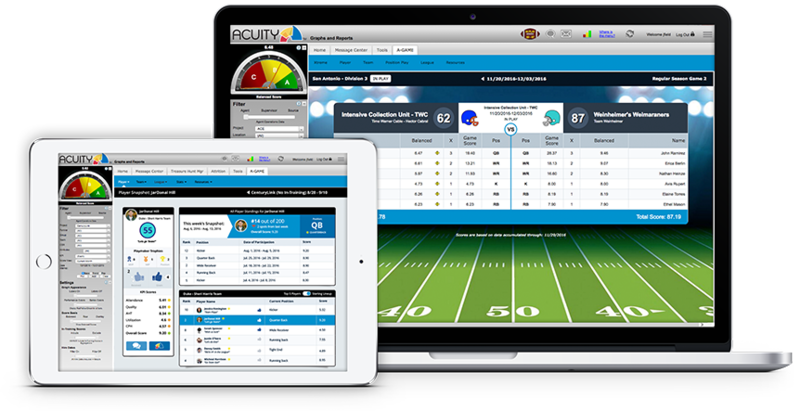 A-GAME tournament scoring is based on specific KPIs or balanced scores sourced from the Acuity Performance Management Platform and/or other data source/s and updated in real time. A-GAME Xtreme owners draft "fantasy" teams from across contact center operations that compete in a separate VIP tournament. Most valuable and improved players, coaches, owners and more are calculated auromatically, providing new and meaningful ways to recognize outstanding performance. TouchPoint One recognizes the top teams and agents among all participating companies with the Medal of Excellence Award. A-GAME Xtreme enables employees other than supervisors and agents, who participate in A-GAME primary leagues, to compete against other fantasy teams created from the entire agent roster using either a traditional fantasy draft or auto-pick process. The Xtreme fantasy leagues operate alongside non-fantasy and maintain separate team schedules, standings, stats and season-end championships. A-GAME Xtreme bonds front-line agents directly with senior management, fosters unprecedented interdepartmental cooperation and stimulates company-wide engagement to improve contact center performance and strengthen business results. A-GAME Xtreme offers contact centers a fresh and dynamic mechanism to address morale, retention, absenteeism and employee engagement challenges and helps ensure that the contact center is adequately equipped to fulfill its increasingly vital role in an organization’s overall success. Contact center organizations are seeking turn-key gamification solutions to improve the customer experience, strengthen the work culture and improve business results,” said Greg Salvato, CEO of TouchPoint One. 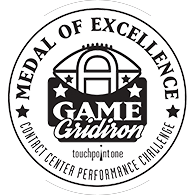 75% of participants inspired by A-GAME to perform their best. 92% Favorable or Loved It. measure of performance improvement above your normal average prior to the A-GAME season start. Recognize, reward and inspire your team to achieve!